1. Toast the spices in a dry frying pan for 2-3 minutes, until fragrant. Crush in a pestle and mortar with the clementine zest, thyme leaves, sugar and 50g sea salt until finely ground, then stir through the remaining salt. 2. Prepare the goose. Trim the excess fatty skin from around the neck and the opening of the cavity and remove the internal fat and giblets; discard the fat and set the giblets aside. Rub the salt mixture all over the bird, inside and out. Chill, uncovered, for at least 2 hours, preferably overnight (or up to 12 hours). 3. Preheat the oven to 150˚C, gas mark 2. Remove the bird from the fridge 1 hour before cooking, rinse off the salt, then pat dry all over with kitchen paper. Put the vegetables and garlic in a large, deep roasting tin with the wing tips and goose neck from the giblets. Put the bird, breast-side down, on top; coat all over with the oil. Fill the cavity with the thyme stalks, bay leaves and whole, zested clementines, pierced with a knife. 4. 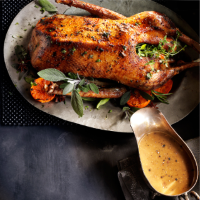 Roast the goose for 1 hour 20 minutes, turning halfway, and basting regularly, until golden and piping hot throughout (a meat thermometer should register 65˚C in the thickest part of the breast). Meanwhile, trim any sinew from the offal (liver, kidney and heart) from the giblets, rinse and put in a bowl, cover with milk and chill until needed. 5. Remove the goose from the tin and rest, breast-side down, tightly wrapped in a double-sheet of foil for at least 40 minutes, or up to 2 hours. Pour the excess fat from the tin and use for your potatoes. Turn the oven up to 220˚C, gas mark 7, and drain the offal. Put the offal in the tray and roast for 15 minutes, until browned. It can now be used to make your gravy (see recipe overleaf ). 6. Rinse out the tin and add the clementines, halved widthways. Return the goose to the tin and cook, breast-side down, for 15 minutes. Flip over and roast for a final 15 minutes, or until golden. Transfer to a board; fill the cavity with the fresh herbs; rest for 10 minutes. 7. To carve, slice off the whole breasts and cut into thick slices. Remove the legs and either divide into drumsticks and thighs, or put on a clean pair of rubber gloves and tear the tender meat into large chunks. Serve with the gravy, trimmings and roasted clementines, ready to squeeze over. This recipe was first published in Tue Dec 01 16:09:13 GMT 2015.